Coffee has been bringing people together for hundreds of years. Communities are built over a cup of coffee. Business meetings, political gatherings, connecting with old friends, exploring a new relationship; coffee is the binding agent that makes the magic happen. In turn, coffee shops become cornerstones of community development and revitalization. 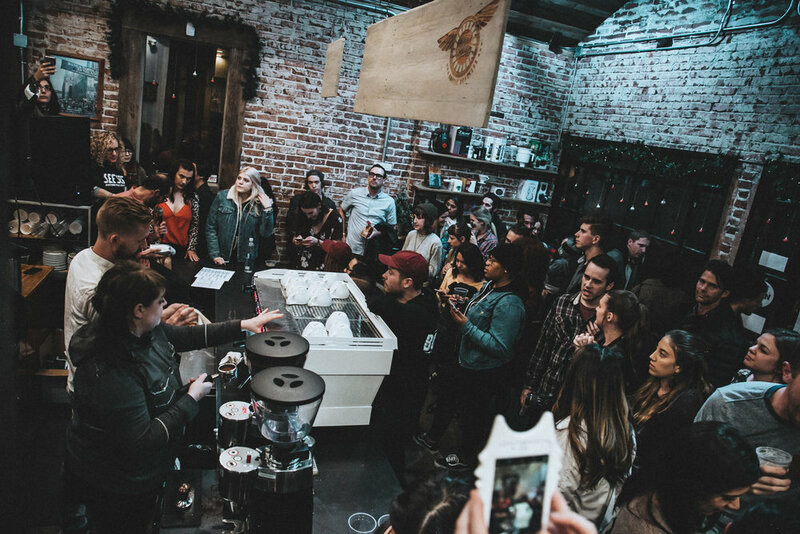 At the Hub, we have seen the kind of community that can grow through coffee firsthand. We opened our first location in June 2009 at 32 Cheney between Virginia and Center street. At the time, there were only a handful of businesses in the surrounding area including Junkee’s Clothing Exchange, SÜP, and Aces Tattoo. These businesses became the foundation of what would become Reno’s bustling Midtown District. Within a few years of opening, more businesses began to look for locations in Midtown and two large developments, The Sticks Project and 777, began construction. Midtown is now one of the most sought after neighborhoods in Reno for both business and residential purposes. As our community grew, so did the demand for our coffee. In June of 2013 we opened our second location in the historic Powning District on the banks of the Truckee River at 727 Riverside. The Powning District was once home to Reno’s large Italian immigrant population and has a vibrant history. The area had never been developed for business and was frequently overlooked as a relic of Reno’s past. When the Hub first moved into the area, the decision was met with some criticism, but when the renovations were finished, the beautiful cafe began to come to life and is now an iconic part of Downtown Reno and our flagship cafe. In 2014, an initiative began under Mayor Hillary Schieve to reiterate the strong relationship between Reno and the University of Nevada. Part of the University Town initiative encouraged businesses to interact with University students more and vice versa. When the opportunity to open a cafe across the street from the campus presented itself, we jumped at the chance to become part of university life. Our Hub University location opened November of 2015 at 941 North Virginia, next to a new Laughing Planet Cafe and a locally owned bike shop; Dropout Bike Shop. When we were approached to become a part of the Reno Town Mall, the decision was clear. Reno Town Mall is widely recognizable but has a reputation of being underutilized and outdated. The mall has been a bedrock for many people in the community. As the longtime home of the Sierra View Library and more recently Nevada Job Connect and Access to Healthcare Network, Reno Town Mall provides resources to some of the most vulnerable people in our community. The mall is also home to the Reno-Sparks Convention and Visitors Authority (RSCVA) and is across the street from the Reno-Sparks Convention Center. The Hub is moving in with the hopes of bridging our strong customer base with the supportive community that is already present in the mall. Throughout our opening, we have been greeted with open arms and anticipation. We can’t wait to bring people together over a quality cup of coffee and a mutual love of the Biggest Little City.